All sorts of ways to get here – all via road I’m afraid. Those southern-types aint into walking over fields and ambling about like we can do ‘ere up North. Best way to get here really, is get to Chipping Norton (a good little town with many good folk there), and ask! Take the road out of the town to Over Norton, taking the first road left as you enter the village. Go along this country lane for a mile until you reach a crossroads at the top of the hill. Turn right at the crossroads and watch out for the parking space at the roadside a few hundred yards along. Stop there and walk through the gate to go round to the other side of the trees. (if there’s a Rollright Trust member there loitering in the entrance asking you for some money to walk or sit by the stone circle – don’t give ’em it! They’ve used the cash for poisoning the wildlife in the past (killing the moles, field mice and other indigenous creatures there) and then lied about what they did (reckoning it was nowt to do with them! ), so I wouldn’t trust them). There’s masses to be said on this site, which I can’t add all in one go (I’ve literally got a full unpublished book on the many aspects if this lovely site) — so this entry will be updated occasionally with additional bits and bats of info and images as time floats by. 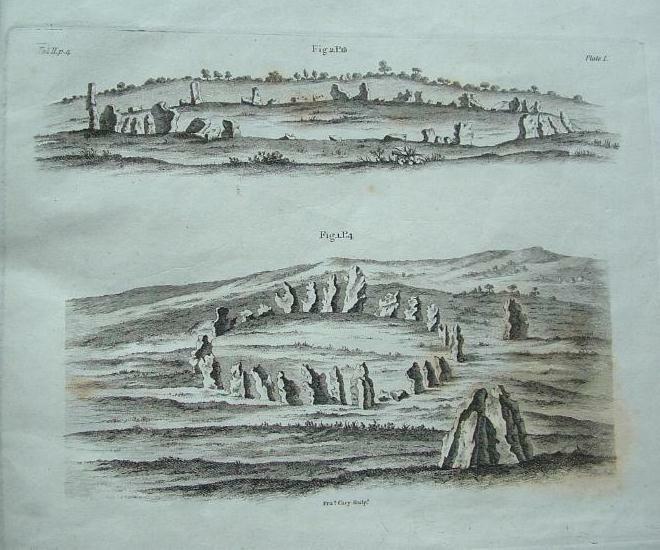 This remarkable and quite atmospheric megalithic complex has so much to say for itself that entire books have been written on the place (see the extensive references below), dealing with its archaeology, folklore and ritual use. The King’s Men is a near-perfect circle of oolitic limestone uprights. Thought for centuries to be the memorial site of some victory by the Danish King Rollo, they have been described by many historians, travellers and antiquarians from the 14th century upwards. 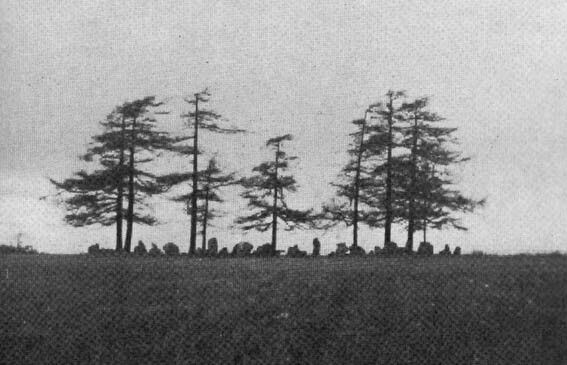 Several early writers described a sort of “avenue” running from the circle, not unlike the one perceived at Stonehenge and elsewhere. Evidence for this cannot be fully disregarded, as there are some recumbent monoliths along the road beside the stone complex, known as the Jurassic Way. This was a prehistoric trade route and it is more likely than not that some other uprights would have been nearby. The Rollright Stones were used as the prime base for what was known as the Dragon Project: an exploratory examination of potential electromagnetic anomalies that were recorded at the standing stones here by scientists, geomancers and archaeologists who were involved daily monitoring work over many years. Much of this was published in Paul Devereux’s book, Places of Power – required reading for everyone who pretends an interest in megalithic sciences. 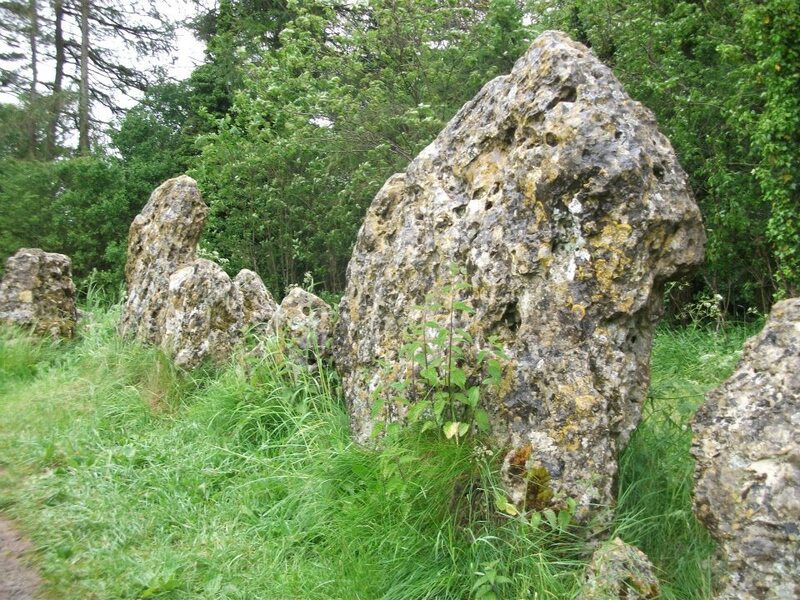 The Rollright complex today consists primarily of three sites: the Whispering Knight’s portal dolmen, the King’s Men stone circle, and the King Stone. Of these, it is the stone circle which draws most attention. Several alignments are connected with the complex. The original ritual use of the place would have, primarily, involved rites of passage and death rituals; though it seems obvious that menstrual rites were also an important social event here. 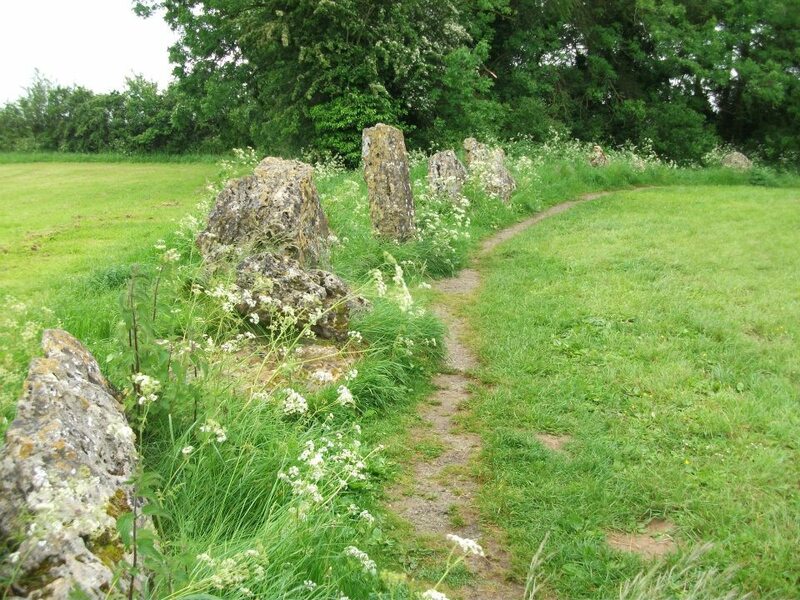 After dark, this stone circle has distinctly ‘female’ spirit, sometimes manifesting in a quite wrathful form (please don’t confuse any of the modern witchcraft mythos with such things – they are fundamentally different in both social and ritual aspects). Women obviously played a large part in the ritual use and geomantic layout of the original complex. It also seems likely that the stone circle was used as a moot spot, which may have been in use until medieval times. The recent discovery of the carving of a family crest, at least 500 years old, implies this. Until Tom Wilson and I lived in the hut at the circle in the 1990s, previous reports of ‘carvings’ at the stone circle were few and debatable. But two of the stones in the Rollright circle have quite distinct carvings on them. The most pronounced is etched on the tallest stone (stone 1 – Barnatt Survey) and comprises of a typical heraldic shield – although we cannot, as yet, ascertain the motif in the middle of the shield. This was first seen by a visiting tourist who wanted to remain anonymous, but the finding was written up in an article I wrote shortly afterwards. (Bennett 1999) The image below – reproduced courtesy of Alistair Carty’s Archaeoptics Limited laser scanning company – clearly shows the carving, which confirmed the initial discovery. The report of his findings can be read here. Not unsurprisingly, since the discovery of the shield various screwy interpretations have been put forward to account for the design. My favourite has to be the one suggested by a pagan friend of the Rollright Trust, who, occult-like and all secret (y’ get the drift) reckoned it was all to do with King Arthur! Needless to say, my response of, “Y’ talking bollox mate!” was received somewhat nervously by pagan Karin Attwood and the twee little entourage who were discussing the shield, in the usual ‘secrecy – secrecy’ hush-hush tone of false witches and similar idiots! Folklore ascribes that the number of stones in the complex cannot be counted (a motif found at other megalithic sites) and, intriguingly, of the surveys done here, no two are the same! 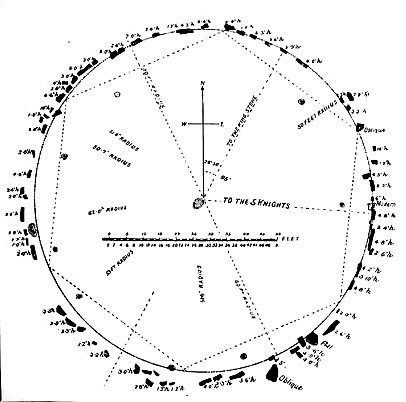 One early illustration of the circle shows 30 stones, nother describes 46, and one survey describes just 22 stones! As the 20th century progressed the numbers increased dramatically, with surveys differing at 58, 60, 71, 72, 73, 77 and 105. The present-day ‘guesstimate’ is about 77. Weird! The best-known folk tale of this place is of the King, his men and the knights, who “were once men who were changed into vast rocks and fossilised,” as Camden first put it in 1586. The King’s men sometimes go to drink at a well near Little Rollright, as does the king, but he only goes at certain times. At midnight however, on certain days, the King’s Men have sometimes been known to come to life, join hands and dance in a circle. This sounds more like a folk remnant of ritual use here. Bennett, Paul & Wilson, Tom, The Old Stones of Rollright and District, Cockley Press: London 1999.
Cooper, Roy, ‘Some Oxfordshire Leys,’ in The Ley Hunter 86, 1979. D., A.J., ‘Rollwright or Rollright,’ in Notes & Queries, 2nd series, 7, 1859. Evans, Arthur J., ‘The Rollright Stones,’ in Trans. Bristol & Glouc. Arch. Soc., 40, 1892. Liebreich, Karen, UneXplained: Spine-tingling tales from Real Places in Great Britain and Ireland, Kindle 2012. Saltzman, L.F. (ed. ), Victoria County History of Oxford, Dawsons: London 1970 (first published 1939). Acknowledgements: HUGE thanks to Marion Woolley for her images in this site profile, and other memorable ventures at this awesome megalithic ring! 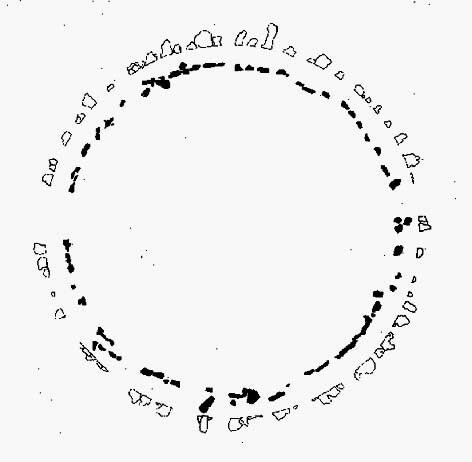 This entry was posted in England (south), Oxfordshire, Stone Circles and tagged alignments, animism, antiquarian, antiquities, archaeoastronomy, Archaeology, astroarchaeology, bibliography, Bronze Age, cailleach, carvings, Chipping Norton, Dragon Project, earth mysteries, english heritage, folk-lore, folklore, heritage, legends, leys, Long Compton, megalithic, Megaliths, neolithic, Oxfordshire, Petroglyphs, petroglyphs, prehistoric sites, ritual, Rollright Stones, Rollrights, sacred sites, Standing Stones, stone circle, witchcraft, witches. Bookmark the permalink.